Corresponds to event #90 in LIP record database. For over a century, a great number of geologic, geochemical, and geophysical studies have focused on the Mesoproterozoic (1.1Ga) volcanic, intrusive, and sedimentary rocks that compose the Midcontinent rift (MCR) in the Lake Superior region. Over the past couple decades, however, such studies have vastly improved our understanding of the three-dimensional structure and tectono-magmatic evolution of the MCR. These studies have come to identify the Midcontinent Rift as one of the best preserved large igneous provinces of Precambrian age. This recognition has come about due largely to the acquisition of several kinds of high quality data: 1) high-resolution aeromagnetic data (Chandler, 1990; Teskey et al., 1991, Daniels and Snyder, 2002; Chandler and Lively, 2007); 2) deep-crustal seismic reflection profiles (Behrendt et al., 1988; Chandler et al., 1989; Cannon et al., 1989; Hinze et al., 1990; McGinnis and Mudrey, 1991; Hinze et al., 1992; also see papers in 1994 Special Issue of Canadian Journal of Science v. 21, no. 4,); 3) petrochemical and radioisotopic data (Brannon, 1984; Green, 1986; Sutcliffe, 1987; Paces and Bell, 1989; Nicholson and Shirey, 1990; Klewin and Berg, 1991; Lightfoot et al., 1991; Shirey et al., 1994; Shirey, 1997; Wirth et al., 1997; Vervoort and Green, 1997; Hollings et al., 2007A & B); and 4) high precision U-Pb dates of volcanic and intrusive rocks (Davis and Sutcliffe, 1985; Palmer and Davis, 1987; Davis and Paces, 1990; Heaman and Machado, 1992; Paces and Miller, 1993; Davis and Green, 1997; Zartman et al., 1997; Vervoort et al., 2007; Heaman et al., 2007). In addition to the rapid increase in empirical data, conceptual changes as to how continental flood basalts and other large igneous provinces develop and evolve (e.g., White and McKenzie, 1989; Campbell and Griffiths, 1990), particularly with regard to the role of mantle plumes, have played a major role in shaping the ideas about the origin of the MCR (Miller and Vervoort, 1996; White, 1997; Nicholson et al., 1997; Vervoort et al., 2007). 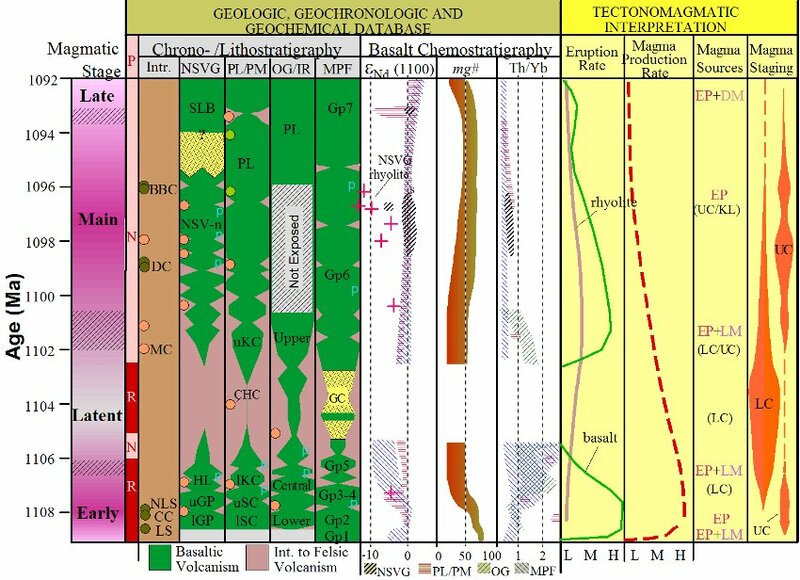 We present here a brief overview of MCR geology, structure, and chemostratigraphy, and present some current ideas about its tectono-magmatic evolution. Although buried by younger Phanerozoic sediments over most of its length, the arcuate, segmented path of the MCR is easily traceable along a 2500-km-long gravity and magnetic anomaly that projects southwest and southeast of exposures in the Lake Superior region (Fig. 1). Along its southwestern arm, the rift crosses several geologic provinces (Holm et al., 2007; Fig. 2). In the Lake Superior region, the rift arcs across Late Archean (2.8-2.6 Ga) granite-greenstone terranes of the southern Superior province. From Lake Superior south to Iowa the rift crosses various terranes of the Paleoproterozoic (1.85 Ga) Penokean Orogen. The northern part of the orogen is composed of sedimentary rocks deposited at the continental margin of the Superior craton that display increased deformation and metamorphism to the south (Cratonic Margin Domain, Fig. 2). South of the Niagara fault zone, a major suture zone, the orogen consists of an island arc assemblage of volcanic, intrusive, and immature sedimentary rocks (Pembine-Wausau Terrane, Fig. 2), as well as a block of isotopically reset Archean rocks, including gneiss dated at 3.6 Ga (Marshfield Terrane, Fig. 2). South of another major suture zone - the Spirit Lake Tectonic Zone (Fig.1), which is largely inferred from geophysical and isotopic data - the MCR cuts across the Yavapai Province, a 1.7 Geon accreted terrane composed dominantly of felsic igneous rocks. Metamorphism, deformation, plutonism, and gneissic doming associated with the Yavapai orogeny overprint much of the Penokean as far north as the southern shore of Lake Superior (Fig. 2). The eastern arm of the MCR (Fig. 1C) is deeply buried beneath Paleozoic rocks of the Michigan basin and has been encountered in only a few deep drill holes. The gravity and magnetic signature of the MCR ends abruptly where as it crosses the geophysical trace of the Grenville front in southeastern Michigan at nearly a right angle. The Grenville front is a tectonic boundary marking the northwestern limit of penetrative deformation and metamorphic effects produced by the Elzevirian (1240 to 1160 Ma) and Ottawan orogenies (1090 to 1025 Ma), which together created the Grenville province (Easton, 1992). These two orogenies bracket the period of igneous activity and rifting of the MCR (1115-1086 Ma; Heaman et al., 2007). Cannon (1994) has suggested that rifting of the Midcontinent occurred during a period of diminished compression within the Grenville province when late tectonic inversion of the rift resulted from renewed tectonism of the Ottawan orogenic phase. Figure 2: Geotectonic map of the north-central United States showing the major Precambrian terranes cut by the Midcontinent Rift (modified from Holm et al., 2007). From exposures around Lake Superior (Fig. 3), it has long been recognized that the MCR is composed of three major components: 1) a thick edifice of subaerial lava flows, 2) local concentrations of intrusive rocks, and 3) an upper sequence of sedimentary rocks. Seismic profiles across Lake Superior and gravity data indicate that the deepest part of the MCR lies beneath western Lake Superior and contains as much as 30 km of fill, with volcanic rocks comprising about two-thirds of the total (Cannon et al., 1989; Allen et al., 1997; Fig. 4). A minimum estimate for the volume of mafic rock in the Lake Superior region is 1.3x106 km3 (Hutchinson et al, 1990). These geophysical data also suggest that a volume of magma nearly equivalent to that filling the rift, underplated the crust such that complete crustal separation probably occurred at least in the western Lake Superior area (Behrendt et al., 1988; Thomas and Teskey, 1997; Allen et al., 1997; Fig. 4). Considering the rift fill, the volume of underplated material and the unknown amount of eroded material, it is clear that the Midcontinent Rift is one of the world’s largest large igneous provinces. Figure 3: Mesoproterozoic geology of the Lake Superior region. Major volcanic and intrusive units are labeled. Dashed lines denote major reverse faults: KF-Keweenaw Fault, IRF-Isle Royale Fault, DF-Douglas Fault. Red line denotes GLIMPCE Line A - the seismic reflection profile used for the geologic crustal model shown in Figure 4. Blue dashed lines indicate buried crustal blocks: GM – Grand Marais block, WR –White’s Ridge, and SFC – Schroeder-Forest Center ridge (see gravity expression of blocks in Figure 1A). Although faulting and burial of thicken portions of the rift fill beneath Lake Superior preclude studies of a continuous and complete sequence of the rift stratigraphy, its main components may be pieced together from exposures around the Lake Superior basin (Fig. 3). The volcanic sequence is composed of predominantly tholeiitic to subalkaline flood basalts, but also includes intermediate and felsic flows and fluvial interflow sedimentary rocks (Green, 1982). All lavas except for a few of the basal flows were erupted subaerially and most have the sheet-like form of flood basalts. Several notable exceptions are the intermediate to felsic composite volcanoes represented by the older Kallander Creek Volcanics of the Powder Mill Volcanic Group (Nicholson et al, 1997), the younger Porcupine Mtn Formation (Cannon and Nicholson, 1992; Zartman et al., 1997) in the Wisconsin-Michigan border area, and the Michipicoten Island Formation (Annells, 1974) in eastern Lake Superior (Fig. 3). 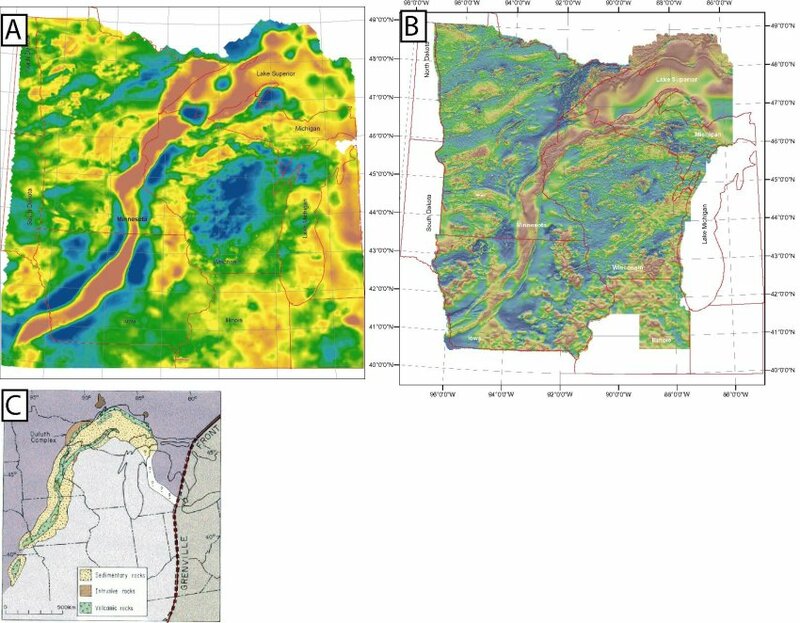 Figure 4: Geologic crustal model across the central part of Lake Superior based on seismic reflection data along GLIMPCE Line A (shown in Figure 3) and Bouger gravity data (after Thomas and Teskey, 1994) . IR and KF denote the Isle Royale and Keweenaw Faults, respectively. High density lower crust is interpreted to be mafic underplated material. Petrochemical and isotopic data indicate that most basalts were derived from a primitive, high-Al olivine tholeiitic primary magma that was generated from a common, chondritic to mildly enriched mantle source (e.g., e Nd(i) between -3 and +3; Paces and Bell, 1989; Nicholson and Shirey, 1990; Shirey et al., 1994). Some compositionally distinctive picritic basalts with high mg#, low Al2O3, and elevated incompatible element abundances form the earliest flows in the Mamainse Point Formation (Klewin and Berg, 1991), the Osler Group (Lightfoot et al., 1991), and diabase sills in the Lake Nipigon area (Sutcliffe, 1987). These picritic compositions could not have been derived from the olivine tholeiitic primary magma, but instead appear to have been generated by lower degrees of partial melting of a deep (>100 km) garnet-bearing mantle source. Felsic and intermediate lavas show a broad range of crustal contamination effects and vary in their proportion of the volcanic sequence from less than 2% in the Portage Lake Volcanic Group (Nicholson, 1992) to as much as 25% in part of the North Shore Volcanic Group (Green and Fitz, 1993). A general, nonsystematic progression toward more primitive (higher mg#) compositions upward through the volcanic sequences is recognized throughout the rift (Green, 1982; Klewin and Shirey, 1992). Intrusive rocks are found in four major complexes in the Lake Superior region: 1) the Coldwell Complex and related alkalic/carbonatitic intrusions of northwestern Ontario; 2) Nipigon/Logan diabase sills emplaced into Paleoproterozoic (Animikie Gp) and Mesoproterozoic (Sibley Gp) sedimentary rocks in the Lake Nipigon-Thunder Bay area of Ontario; 3) the Mellen Complex near the Michigan-Wisconsin border; and 3) the Duluth Complex and related intrusions of northeastern Minnesota (Fig. 3). All complexes were emplaced in multiple intrusive events of varied magma composition. The alkaline gabbroic to syenitic Coldwell Complex and many smaller intrusions, ranging from nepheline syenites to carbonatites, were emplaced as subcircular bodies into Archean crust along two zones extending north of the main rift zone (Currie, 1976). These zones correlate with older crustal structures and may indicate emplacement along zones of crustal weakness or reactivation. In contrast, both the Duluth and Mellen are composed of tholeiitic mafic layered intrusions containing troctolitic, gabbroic, and anorthositic cumulates and some granophyric bodies. These tholeiitic complexes were emplaced as multiple sheet-like intrusions into the basal part of the comagmatic volcanic pile (Miller et al., 2002). Although the difference in size between the two complexes (Fig. 3) reflects in part the steeper rift-ward dip of the Mellen Complex, gravity data indicate that the Duluth Complex is significantly larger in volume. The Duluth Complex has a surface area of over 5000 km2, is situated over two of the largest Bouger gravity anomalies (>50 mgals) associated with the MCR, and is estimated to be rooted to a depth of as much as 13 kilometers (Allen et al., 1997). The largely fluvial redbed sedimentary rocks that fill the rift include four lithostratigraphic groups: 1) thin pre-volcanic quartzose fluvial and lacustrine deposits; 2) syn-volcanic interflow volcaniclastic sedimentary rocks; 3) post-volcanic, immature sedimentary rocks of the Oronto Group; and 4) quartzose sandstone of the Bayfield Group and Jacobsville Sandstone (Ojakangas and Morey, 1982). With the waning of volcanism, Oronto Group sedimentation filled subsiding axial rift basins with as much as 9 km of conglomerate, sandstone, and minor shale. With the formation of a central horst in some segments of the rift basin due to late compression, the Oronto Group sediments were locally reworked and deposited mostly into marginal basins where they accumulated to as much as 6 km in thickness (Fig. 4) to form the mature sandstones of the Bayfield Group and Jacobsville Sandstone (Allen et al., 1997). The regional structure of the MCR has several complicating elements that cause it to deviate from the classic picture of an intracontinental rift (e.g., Rosendahl, 1987). The most obvious feature affecting this complexity is late reverse faulting that created a segmented axial horst of volcanic rocks flanked by thick sedimentary basins along most of the southwestern arm of the MCR (Figs. 1C & 3). Recent seismic profiling has shown that the reverse faults accommodated about 30 km of shortening across most of the southwestern arm (Chandler et al., 1989; Woelk and Hinze, 1991; Anderson, 1997, Berendsen, 1997). At least 5 km of reverse vertical displacement on the Keweenaw and Isle Royale faults (Fig. 3) is evident on some seismic profiles (Fig. 4; Cannon et al., 1989). Horst geometry is not as well defined on the southeastern arm of the rift. Seismic profiles and potential field data in eastern Lake Superior indicate much less shortening (Thomas and Teskey, 1994; Samson and West, 1994), roll-over structures common to transpressional faulting (Mariano and Hinze, 1994), and reverse faulting transverse to the rift axis (Manson and Halls, 1994). These relationships suggest that late compression was northwest-directed, thereby causing rift closure and inversion by reverse faulting along the southwestern arm and strike-slip or oblique faulting along the southeastern arm (Cannon, 1994). Removing the effects of the late compression, the extensional structures of the rift also reveal themselves to be complex. Geophysical models across the MCR in the western Lake Superior region and along its southwestern arm, suggest that it was composed of a series of en echelon asymmetric graben that change their polarity across subtle to well-defined accommodation zones (Chandler et al., 1989; Cannon et al., 1989; Dickas and Mudrey, 1997; Anderson, 1997; Berendsen, 1997). Most of the volcanic rocks of the rift are confined within these now-inverted grabens, whose boundaries are commonly defined by the reverse faults (Hinze et al., 1982; Hinze et al., 1992; Thomas and Teskey, 1994). Whereas 10 to 20 km of volcanic rocks commonly are contained within the graben, lava accumulations outside the graben rarely exceed 5 km (e.g., Fig. 4). This implies that some of the reverse faults must have originally acted as growth faults and perhaps magma conduits to rapidly subsided and infilled axial graben (Cannon, 1992). Moreover, whereas volcanic rocks outside the central graben are predominantly older lava accumulations of reversed paleomagnetic polarity, younger normal polarity lavas comprise most of the volcanic sequences within the graben (Figs. 3 & 4). This suggests that graben formation began some time after the initiation of volcanic activity (Cannon et al., 1989). 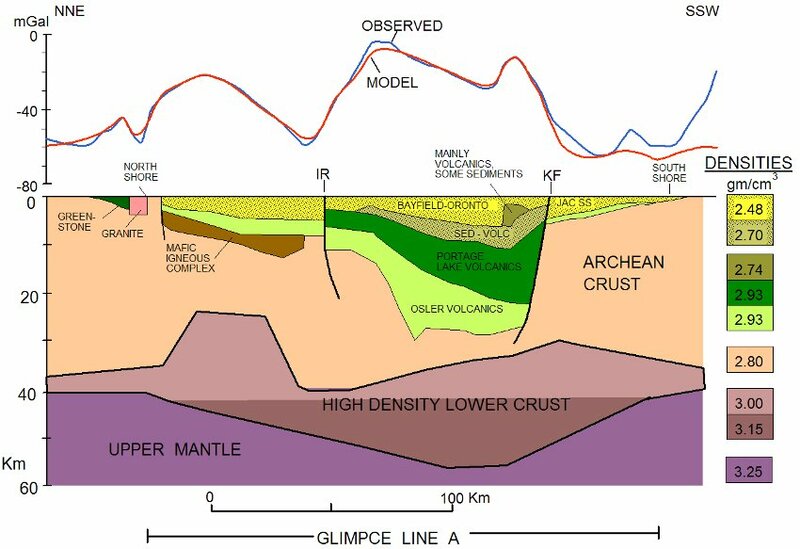 Interestingly, beneath the eastern part of Lake Superior, where an axial graben is evidently not well developed, older reversed polarity lavas are interpreted to comprise most of the sequence (Mariano and Hinze, 1994). In western Lake Superior, the rift structure is further complicated by the effects of large, isolated crustal blocks within the volcanic basins. Integrated modeling of gravity, magnetic, and seismic data over western Lake Superior (Sexton and Henson, 1994; Allen et al., 1997) has identified two areas within the axial part of the rift where the volcanic section pinches out. These areas are presumed to be large blocks or ridges of granitic crust, called the Grand Marais block and White's ridge (Figs. 1A, 3). These blocks may represent detached pieces of crust that did not subside and became isolated during separation. During volcanism, they stood as structural highs and exerted significant control on the shape of the graben into which the lavas accumulated, particularly the Portage Lake Volcanics (PLV). Allen et al. (1997) demonstrated that the axis of the central rift basin is centered between the Keweenaw Peninsula and Isle Royale and then curves around the Grand Marais block to the northwest toward the Minnesota coast. 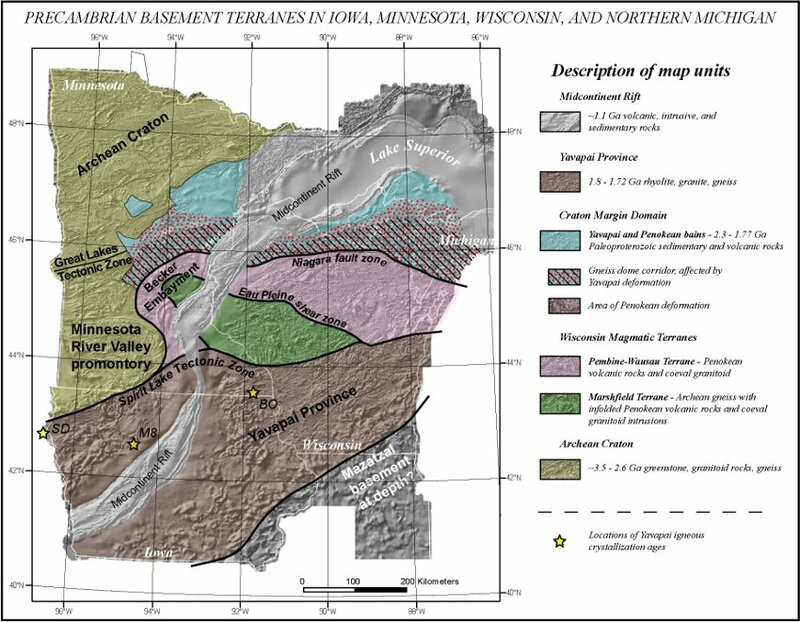 Miller and Chandler (1997) have suggested that the western growth fault margin of the PLV-equivalent rocks in Minnesota corresponds to an extensive arcuate dike and sill complex that is part of the hypabyssal Beaver Bay Complex. White's Ridge further divides the PLV basin from another deep trough of volcanics to the southwest (Fig. 3). Prior to 1985, the principal means of correlating MCR volcanic sequences in the Lake Superior region was by their magnetic polarity and apparent pole position of remnant magnetism. In the western Lake Superior basin, most volcanic rocks were correlated relative to a single magnetic polarity reversal from early reversed to late normal (Fig. 3). However, at Mamainse Point in eastern Lake Superior, an additional normal and reversed interval has been noted (Annels, 1973; Klewin and Berg, 1990). In the past decade, high-resolution U-Pb geochronologic studies of zircons and badellyites have replaced paleomagnetism as the main correlation tool for the volcanic and intrusive rocks of the MCR and have proven to be very important in the rapid expansion of our current knowledge of the rift. Ironically, the U-Pb dates had until recently clouded the magnetostratigraphy of MCR, giving conflicting dates for the age of the major paleomagnetic reversal in the western Lake Superior region. The age of the major R-N reversal was first estimated to have occurred around 1098 Ma based on a date of 1097±4 Ma for the uppermost reversely polarized lava in the Osler Volcanic Group, the Agate Point rhyolite (Davis and Sutcliffe, 1985), and an age of 1096.2±1.8 Ma for the lower part of the normally polarized Portage Lake Volcanics (Davis and Paces, 1990). However, subsequent dates from normal polarity rocks of the Duluth Complex yielded ages as old as 1099 Ma (Paces and Miller, 1993). Davis and Green (1997) reanalyzed zircons from the Osler sample and acquired a new age of 1105±2 Ma. With the oldest normally polarized age in the western Lake Superior basin now being the 1102±2 dates for the granitic rocks of the Mellen Complex (Zartman et al., 1997), the age of the major reversal is now pegged between 1105 and 1102 Ma (Fig. 5). Figure 5 gives the general chronostratigraphy of the rift based on the current collection of over 50 published and unpublished dates. It is now well established that magmatic activity associated with the MCR spanned about 30 million years from 1115 to 1084 Ma. Moreover, there is a clustering of dates from both volcanic and intrusive rocks into three to four major populations: an early group of reversed polarity rocks at 1115-1107 Ma, a main stage group at 1102-1092 Ma, and a late stage group from 1092-1086 Ma. Heaman et al. (2007) speculate that an even earlier stage of MCR-related magmatism occurs between 1150 and 1130 Ma defined by the ages of lamprophyre dikes in the Lake Superior region and of the Abitibi dike swarm, which extends to the east of Lake Superior. However, no volcanic rocks of this age occur in the Lake Superior region. Most data from the Western Lake Superior basin indicate that the main onset of magmatic activity associated with the MCR occurred about 1109 Ma. U-Pb ages from the lowermost (reversed) volcanic sequences and some subvolcanic sills in Ontario, Minnesota, NW Wisconsin, and Upper Michigan define a very tight cluster of ages from 1109-1107 Ma (Davis and Sutcliffe, 1985; Paces and Miller, 1993; Davis and Green, 1997; Zartman et al., 1997). However, recent ages of mafic intrusives mostly in the Lake Nipigon area indicate that rift-related magmatic activity may have begun as early at 1120 Ma (Heaman et al., 2007). Although U-Pb ages from the lowermost Mamainse Point sequence along the northeastern side of Lake Superior (Fig. 3) have not yet been obtained, it is nevertheless curious that ages greater than 1109 Ma are not seen in the dated volcanic sequences. Figure 5: Compilation of U-Pb ages of intrusive and volcanic igneous rocks from various areas along the Midcontinent Rift. (unpublished figure prepared for Green et al., 2005). What is referred to as the main magnetic reversal in the text occurs at ~1105 Ma. An apparent hiatus or diminution of mafic magmatic activity between 1107 and 1102 Ma (Fig. 5) appears to be real at least among the exposed volcanic and intrusive sequences in the western Lake Superior basin. Most lava flow sequences spanning this interval are relatively thin and dominated by intermediate to felsic compositions. One of the first indications of a felsic-only magmatism during this “hiatus” period is indicated by the 1106 - 1101 Ma ages of zircons from a rhyolite clast conglomerate within the Portage Lake Volcanics on the Keweenaw Peninsula (Davis and Paces, 1990). More recent dating of volcanic sequences straddling the major magnetic reversal in show a dramatic diminishment of eruption rates and a dominance of felsic volcanism. In the Wisconsin-Michigan border area, the major magnetic reversal occurs within the upper part of the 2- to 4-km-thick Kallander Creek Volcanics, which form the upper formation of the Powder Mill Group (Fig. 3) and are dominated by intermediate to felsic flows (Nicholson et al., 1997). Two rhyolite flows in this upper part, across which the major magnetic reversal occurs, yield ages of 1107.3±1.6 Ma (Davis and Green, 1997) and 1098.8±1.9 Ma (Zartman et al., 1997). In Minnesota, Davis and Green (1997) found a similar age difference (1107.6±2.5 - 1100.5±1.9 Ma) over a 350 m interval of mostly rhyolite and trachybasalt situated midway in the 6+ km-thick northeast limb of the North Shore Volcanic Group (Green, 1972). Thus, over half of the 13 million years of geologic time that is represented by the North Shore Volcanic Group is contained within less than 6% of its total stratigraphic thickness. Direct evidence for a similar diminution in mafic volcanic activity is not available from the Osler Group in Ontario (Fig. 3). However, a U-Pb age of 1105.3±2.1 Ma (Davis and Green, 1997) for a thick rhyolite flow that defines the upper part of the magnetically reversed section and separates two geochemically distinct basalt flow sequences (upper and central suites, Lightfoot et al., 1991) is consistent with such a possibility. U-Pb ages of intrusive rocks of the MCR indicate a similar hiatus in mafic magmatic activity between 1107 and 1102 Ma. All reversed polarity alkaline and diabasic intrusions in Ontario indicate emplacement between 1115 and 1107 Ma (Fig. 5). In Minnesota, Paces and Miller (1993) discovered a hiatus in magmatism between the 1107 Ma emplacement age of the reversed polarity Nathan's layered series (renamed the Poplar Lake Intrusion, Miller et al., 2002) and the indistinguishable 1099 Ma ages of four different intrusive units from normal polarity layered and anorthositic series rocks of the Duluth Complex. Vervoort et al. (2007) report a similar hiatus in U-Pb ages of granophyre intrusions of the Duluth and Beaver Bay complexes. Four reversed polarity granophyre bodies yield ages ranging from 1109.4±5.1 to 1106.0±4.8 Ma, whereas three normal polarity granophyre intrusions have ages of 1098.6±3.6 Ma, 1098.2±5.5 Ma, and 1095.3±3.8 Ma. Two different granitic phases of the otherwise gabbroic Mellen Intrusive Complex in Wisconsin have indistinguishable U-Pb ages of 1102±2 Ma (Zartman et al., 1997). The age of the gabbroic rocks associated with these granites is unclear; however, field relations suggest they are close to those of the granitic rocks. One of the dates is from a granophyre that Olmsted (1969) interpreted as an upper differentiate of the gabbroic Mineral Lake intrusion but that Seifert et al. (1992) suggested is slightly older than the mafic intrusion. The other date is from the granite at Mellen, which intruded and brecciated all other phases of the Mellen Complex (Olmsted, 1969). Although the reduction in magmatic activity between 1107 and 1102 Ma appears to be real for the volcanic and intrusive suites mentioned above, it is not clear whether this reduction in mafic magma eruption is representative of the MCR as a whole. Seismic profiles over the western basin show that magnetically reversed volcanic sequences of the Powder Mill, Osler, and North Shore volcanic groups cannot be directly correlated with thick early accumulations that are apparently buried beneath the main rift axis (e.g., Fig. 4). This may indicate that the presently exposed volcanic sequences accumulated marginally to a now-hidden axial graben basin and are therefore not representative of all volcanic activity in the western basin during this early stage. If this is the case, volcanism became focused into axial graben earlier in the evolution of the western basin of the MCR than present exposures would suggest (Cannon, 1992). In the eastern basin, where graben formation was minimal throughout volcanic activity, a greater thickness of reversed lavas beneath eastern Lake Superior suggests either a greater rate or longer period of basaltic eruption in the early evolution of the MCR (Mariano and Hinze, 1994). The recent discovery of reversed polarity intrusive rocks as old as 1115 Ma in the Lake Nipigon area (Heaman et al., 2007) hints that similarly aged volcanic rocks may lie at the base of the undated Mamainse sequence or in the buried axial root of the rift fill. Moreover, the recognition of two extra paleomagnetic reversals in the Mamainse Point Formation (Annells, 1973) may indicate more or less continuous eruption in the eastern basin, during the period between 1107 and 1100 Ma, while the western basin was in a relatively dormant stage. Nevertheless, a period of volcanic diminution is implied in the medial part of the Mamainse sequence by the occurrence of thick polymict conglomerates and an abundance of felsic rocks (Annells, 1973). Thorough U-Pb dating of this most complete section of MCR magmatism (Shirey et al., 1994) is clearly needed. The late stage of MCR magmatism is bracketed between the upper part of the Portage Lake Volcanics (1094.0±1.5 Ma, Davis and Paces, 1990) and the Michipicoten Island Formation (1086.5+1.3/-3.0 Ma, Palmer and Davis, 1987), the latter being a central volcano complex. As observed in shoreline exposures and inferred from seismic profiles, late stage volcanics interdigitate with conglomerates of the lower part of the Oronto Group indicating that subsidence proceeded at a significant rate despite the waning of volcanic activity. Reverse faulting and inversion of the rift appears to have begun soon after the cessation of volcanism (~1080 Ma) and persisted for about 30-40 m.y (Cannon, 1994). The age of native copper mineralization on the Keweenaw Peninsula spanned a similar time period (1060-1045 Ma, Bornhorst et al., 1988). Integration of geochronologic data and geophysical data has allowed for reasonable estimates of the rates of volcanism and basin subsidence. Assuming the present volume of volcanics in the rift to be about 1.5 million km3and an originally erupted volume of at least 2 million km3 (taking erosion into account), the average eruption rate for the MCR would have been about 0.15 km3/yr (Cannon, 1992). However, if a 5m.y. hiatus in volcanic activity is taken into account, eruption rates during the early and main stages of volcanic activity were probably greater. For example, eruption rates of as much as 0.2 km3/yr have been calculated for the thick Portage Lake Volcanics, assuming a total volume of about 500,000 km3 emplaced over a 2.2 m.y. period (Davis and Paces, 1990; Cannon, 1992) . These rates are greater than ocean plume environments (Iceland 0.05 km3/yr; Hawaii 0.03-0.1 km3/yr), but are comparable to some continental flood basalt provinces (Columbia River 0.07-0.28 km3/yr; Parana, >0.24 km3/yr), and less than others (Deccan 0.4-1.0 km3/yr) (Swanson et al., 1975; Gallagher and Hawkesworth, 1994). Based on similar data, Davis and Paces (1990) calculated a subsidence rate of 1.3 mm/yr for a 2850 m interval of the Portage Lake Volcanics. Cannon (1992) calculated a similar value of 1.5 mm/yr for the average subsidence rate during all of main stage volcanism and estimated a range from 0.5 to 5 mm/yr. He estimated that subsidence after main stage volcanism slowed to an average rate of about 0.2 mm/yr. Overall, the geologic, geochemical, geophysical and geochronologic attributes of Midcontinent Rift in the Lake Superior area can be explained by chemical and physical processes attending the arrival of an anomalously hot mantle plume at the base of the lithosphere at about 1110 Ma . Criteria supporting a plume model include: 1) the estimated volume of more than 2 million km3of erupted material (Cannon, 1992) based on seismic reflection data; and 2) a nearly equivalent amount of magma underplated and intruded into the crust (Berhendt et al., 1990) as suggested by gravity data. This volume of magma requires an anomalously hot mantle source such as would be expected from a mantle plume (Hutchinson et al., 1990). Isotopic data on most mafic rocks of the MCR are also consistent with their derivation from a homogeneous, isotopically enriched mantle plume (Nicholson and Shirey, 1990; Shirey et al., 1994; Nicholson et al., 1997; Shirey, 1997). Indeed, the fact that the earliest volcanic products show undepleted mantle isotopic signatures at a time of minimal lithospheric extension demonstrates that a rising plume was involved in the rifting process from the onset and was probably an integral force driving extension and thinning of the lithosphere (Cannon and Hinze, 1992; Nicholson et al., 1997). The salient geologic, geochemical, and geochronologic data from which a tectono-magmatic model for the rift can be interpreted are summarized in Figure 6. Collectively, these data imply that the magmatic phase of the Midcontinent Rift evolved in several stages with each stage characterized by distinctive magma compositions, structural styles, and rates of eruption and subsidence. Figure 7 (A-D) portrays a tectonomagmatic model interpreted from this data, which is was first proposed by Miller and Vervoort (1996), was further refined by Vervoort et al. (2007), and is described below. Figure 6: Summary of geologic, magnetic polarity, geochemical and geochronologic data from MCR volcanic and intrusive rocks and the tectonomagmatic interpretations of this data (modified from Miller and Vervoort, 1996). The age spans and magnetic polarity of the proposed stages of the MCR are shown in the far left columns. The Chrono- /Lithostratigraphy part of the diagram portrays stratigraphic and geochronologic data for intrusive rocks (Intr.) and four volcanic sequences (NSVG-North Shore Volcanic Gp; PL/PM-Portage Lake/Powder Mill volcanic gps; OG/IR-Osler Gp/Isle Royale (Portage Lake); MPF-Mamainse Point Formation. U-Pb ages (colored circles) of basalt (green), gabbro (brown), and rhyolite/granophyre (salmon) are shown for the different igneous packages for data collected prior to 1996. Relative proportions of felsic (pink) to mafic (green) volcanics and interflow sedimentary rocks (yellow) are schematically portrayed through the four stratigraphic sections. Blue “p” symbols indicate the approximate locations of plagioclase porphyritic flows. Subdivisions within the intrusive and volcanic packages are: Into. : LS-Logan Sills, CC-Coldwell Complex, NLS-Nathan’s Layered Series, MC-Mellen Complex, DC-Duluth Complex, BBC-Beaver Bay Complex; NSVG: lGP-lower Grand Portage, uGP-upper Grand Portage, HL-Hovland lavas, NSV-n-normal polarity NSVG lavas, SLB-Schroeder-Lutsen basalts; PL/PM: lSC-lower Seimen’s Creek, uSC-upper Seimen’s Creek, lKC-lower Kallander Creek, uKC-upper Kallander Creek, PL-Portage Lake, CHC – felsic clasts from the Copper Harbor Conglomerate; OG/IR: Lower, Central and Upper Suites of the Osler Volcanic Gp, PL-Portage Lake Volcanics on Isle Royale; MPF: Groups 1-7 as defined by Shirey et al. (1994). The Basalt Chemostratigraphy part of the diagram shows the range of values in εNd, mg# (MgO/(MgO+FeO), mole %), and Th/Yb for mafic to intermediate rocks from the four different volcanic packages. Also plotted are εNd values for NSVG rhyolite flows (Vervoort and Green, 1997). The Tectonomagmatic Interpretation part of the diagram shows 1) the relative rates of eruption of mafic and felsic magma into the rift basin, 2) rates of magma production due to mantle melting, 3) sources of the magmas (Mafic magmas: EP-enriched plume, LC-sublithospheric mantle, DM-depleted asthenospheric mantle; Felsic magmas: LC-lower crust, UC-upper crust, KL-Keweenawan lavas), and 4) areas of magma staging (LC-lower crust, UC-upper crust/surface). 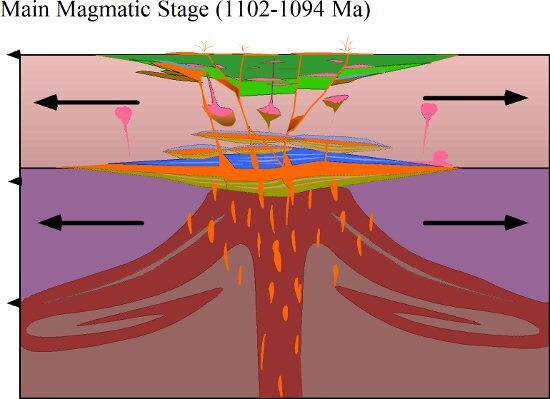 Early Magmatic Stage (1115-1107 Ma) - The onset of magmatism into the MCR occurred during a time of reversed magnetic polarity and was characterize by the rapid eruption of intially primitive magmas that gave way to evolved and contaminated compositions. This stage is thought to represent the impacting of the mantle plume head with the initially cool and brittle lithosphere, the rapid heating of the lithosphere by mantle-derive melts, and the eventual contamination of those melts by their staging in the lower crust (Fig. 7A). The earliest eruptions/intrusions into the MCR basin were evidently primitive mafic to ultramafic (olivine-rich) magmas derived directly from the plume. These created the lower picritic flows of the main volcanic sequences (Grand Portage lavas of the NSVG, Lower Seamen’s Creek of the Powder Mill Gp, Units 1 & 2 of Maimainse Point) and ultramafic to mafic intrusions in the Lake Nipigon area. Although most U-Pb ages of volcanic rocks and many intrusions indicate that initial emplacement of magmas and thus plume impact began at around 1109 Ma, the new ages of intrusions from the Lake Nipigon area indicates that magmatism began earlier, around 1115 Ma. However, the low volume of these magmas, their ultramafic character, and their significant contamination signature from local crustal sources (Hollings et al., 2007A & B) suggest that these might represent precursor melts from the plume when it was still deep in the mantle. Alternatively, perhaps it represents a double headed plume with a small plume head arriving in advance of the main plume (Bercovici and Mahoney, 1995). In any event, the rapid onset of volcanism at 1109 Ma suggests this time represents the main point of impact of the starting plume head with the base of the lithosphere (Fig. 7A). The initial emplacement of primitive magmas rapidly gave rise to evolved mafic magmas with crustal contamination signatures, the onset of felsic volcanism and intrusions and the occurrence of plagioclase porphyritic magmas. This is evident in the Hovland lavas of the NSVG, the Central Suite of the Osler, the Kallander Creek lavas of the Powder Mill Gp, and Groups 3-5 of the Maimainse Point Formation. In the intrusive rocks, this later early stage is represented by the ferrogabbroic Logan sills, the Early Gabbroic Series and Felsic Series of the Duluth Complex, and the alkaline rocks of the Coldwell Complex. At the waning of the early magmatic stage, mafic magmas show the greatest signs of crustal contamination - negative εNd values and elevated Th/Yb ratios (Fig. 6). This is taken to represent the beginning of magma underplating of the crust resulting in crustal assimilation and anatectic melting to produce felsic magmas (Fig. 7A). The occurrence of plagioclase phenocryst-rich magma is also consistent with deep crustal staging, where high pressures will promote plagioclase flotation (Kushiro, 1980). 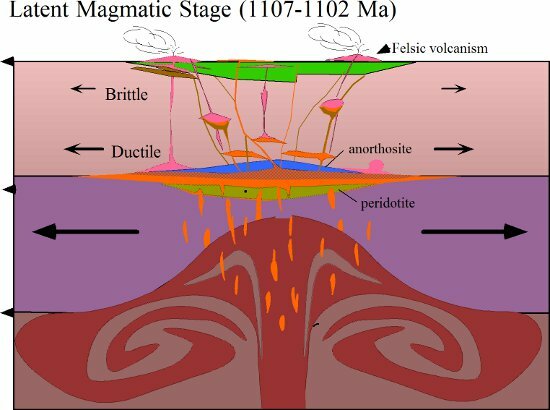 Figure 7A: Early magmatic stage of the MCR (may begin as early as 1115 Ma). Impact of the starting plume head with the initially cool lithosphere results in rapid ascent of primitive magma. As the lithosphere is heated, magma begins to underplate the lower crust. This magma staging result in crustal contamination of mafic magmas and anatexis of the lower crust to produce felsic magmas. Latent Magmatic Stage (1107-1102 Ma) - During this stage, volcanic activity within the rift was largely dormant, except for periodic rhyolitic volcanism. Deposition of high energy sediments indicates that some degree of vertical subsidence occurred within the rift graben during this stage. This stage is termed latent because it is thought to represent a period of continued mantle plume melting, but storage of that melt almost exclusively in the lower crust by extensive crustal underplating (Fig. 7B). Underplating that started during the later part of the early magmatic stage (Fig. 7A) was probably instigated by the heating and anatexis of the lower crust caused by the passage of the earliest mantle-derived magmas coupled with heating from the rising plume. The creation of felsic melts and an increasingly ductile lower crust would have created density and rheologic barriers to impede the passage of mafic melts and promote their ponding at the Moho. Once initiated, mafic magma chambers would have continued to expand as additional rising mantle melts became trapped and triggered more widespread melting of the lower crust. At the peak of the latent stage, the lower crust may have been largely impermeable to mafic magmas. To the extent that lithospheric thinning and extension was driven by the bouyancy and thermal energy of the mantle plume (e.g., Campbell & Griffiths, 1990), perhaps magma underplating actually caused diminished extension of the upper crust by delaminating and structurally decoupling it from the lower crust and lithospheric mantle (Fig. 7B). Although the resumption of volcanic activity at about 1102-1100 Ma (earlier near the axis of the rift) may have been externally triggered by increased extension of the crust, it seems also possible that density cleansing of the lower crust caused by the upward migration of low density felsic melts and perhaps thinning and shouldering aside of the ductile lower crust concomitant with magma underplating may have played important roles in allowing basaltic magmas to emerge from deep crustal magma chambers and bringing on the main magmatic stage. Figure 7B: Latent magmatic stage of the MCR. Ponding of mantle-derived magmas in the vicinity of the Moho resulted in partial melting and ductile behavior of the lower crust. This caused further trapping of magma beneath a felsic magma density barrier such that mafic volcanism was arrested and only period rhyolitic volcanism persisted during this stage. Magma underplating also caused the decoupling of the ductile lower crust from the brittle upper crust such that most crustal dilation was taken up by the lower crust. Main Magmatic Stage (1102-1092 Ma) - This stage was a period of normal magnetic polarity conditions during which renewed magmatic activity was characterized by moderate rates of eruption of uncontaminated (save rhyolite), but diverse magma compositions. 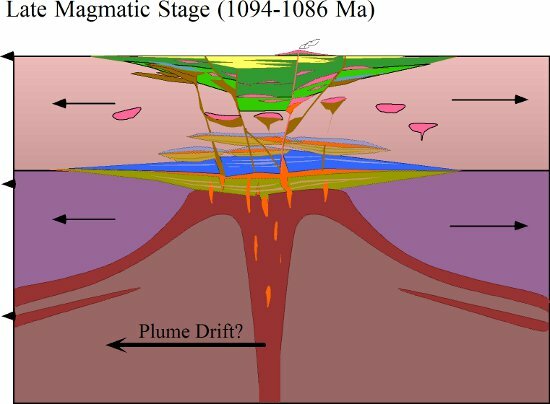 This stage is thought to represent the onset of upper crustal separation, the evacuation of evolved lower crustal magma chambers, and continued, but waning mantle plume melting (Fig. 7C). The main stage is represented by the nearly 10 km thickness of normally polarized North Shore Volcanic Group lavas in Minnesota and at least 5 km of Portage Lake Volcanics in Michigan, as well as the major parts of the Duluth, Beaver Bay and Mellen intrusive complexes. The first few million years of main stage magmatism involved a differentiated range of tholeiitic basalt and minor felsic compositions. Many of the earliest magmas were plagioclase-phyric magmas that created the extensive anorthositic series of the Duluth Complex (Miller and Weiblen, 1990). Although these early main stage magmas were variably differentiated, they showed little in the way of the crustal contamination that characterized the end of the early magmatic stage (see Fig. 6). This probably resulted from crystallization of the margins of the lower crustal magma chambers, which effectively insulated the fractionally crystallizing magmas from interacting with the crust. As main stage magmatism progressed, however, magma compositions came to be dominated by primitive to mildly evolved, high-Al olivine tholeiitic basalts, as characterized by the Portage Lake Volcanics (Paces and Bell, 1989) and the Schroeder-Lutsen basalts which lie atop the North Shore Volcanic Group (Green, 1972) . This suggests that the residence time of mantle derive magmas decreased as the plumbing system of the upper crust became better developed. Felsic magmas continued to be generated by crustal melting during main stage magmatism. However, Vervoort and Green (1997) note that the εNd values of rhyolites are progressively more negative up section (Fig. 6). Vervoort et al. (2007) speculate that the source of felsic magmas migrated to shallower crustal levels over time with early melts derived from Paleoproterozoic-aged lower crust and younger melts generated from Archean crustal rocks. 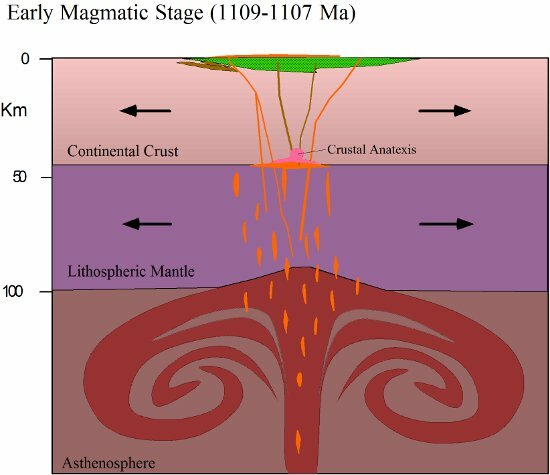 Figure 7C: Main magmatic stage of the MCR. After felsic melts are removed from the lower crust, ponded magma chambers of differentiated (but uncontaminated) magmas are evacuated to the upper crust. Felsic magmas continue to be generated but at higher crustal levels. Late Magmatic Stage (1094-1086 Ma) - As volcanism waned , subsidence of the central grabens evidently continued (Fig. 7D). The central axis of the rift grabens became filled with a thick accumulation of fluvial and some lacustrine sedimentary rocks and progressively fewer volcanic rocks. Soon after the cessation of volcanism at 1086 Ma, many of the original graben-bounding normal faults were transposed into reverse faults. The tectonic inversion of the rift that resulted in the creation of a central horst along most of the southwest arm was accomplished by about 30 km of horizontal shortening (Cannon, 1994), in response to Grenville tectonism. The reason for the cessation of magmatic activity and crustal rifting is not clear. The final melts generated in the Lake Superior region appear to be mixtures of plume and depleted asthenospheric (N-MORB-like) mantle (Shirey et al., 1994; Nicholson et al., 1997). This may represent melting of parts of the plume that had entrained depleted asthenospheric mantle or perhaps melting of both the narrow plume tail and the shallow asthenospheric mantle that infilled behind the dissipated head of the plume. It is also possible that magmatism ended due to drift of the Laurentian Plate off the plume. Approximately 1.1 Ga mafic dikes are well known in the southwest US perhaps indicating a general drift of the plate to the northeast relative to a fixed plume. With the disappearance of the mantle plume, the rift experienced thermal collapse and sediment loading and became filled with as much as 8 km of sediments. The tectonic inversion of the rift by reverse faulting probably began with the last volcanic eruptions at about 1086 Ma (Cannon, 1994) and may have been due either to rejuvenated compression within the Grenville province with onset of the Ottowan orogenic phase at about 1090 Ma or simply to the loss of plume's tensional forces against long standing regional compression provided by the Grenville province. The folding of sedimentary rocks marginal to the horst-bounding faults indicates that the reverse movement took place over an extended period of time. Figure 7D: Late magmatic stage of the MCR. Dissipation of the thermal energy of the plume results in waning magmatism and vertical subsidence due. The rift gradually transitions form volcanic to sedimentary fill. The antiquity of the MCR may lead to the conclusion that plume dynamics in the Proterozoic were somehow different from those that influenced Mesozoic to Tertiary continental rifting and flood basalt volcanism and which form the basis of current models. However, as Shirey et al. (1994) pointed out, the magmatic progression seen in the MCR is similar in many ways to other continental flood basalt provinces. Because the MCR presents one of the most completely exposed sections of flood basalts, by virtue of its incomplete rifting and later tectonic inversion, its tectono-magmatic evolution should also be seriously considered as a test and constraint of general models of plume-generated continental rifting and large igneous province magmatism. 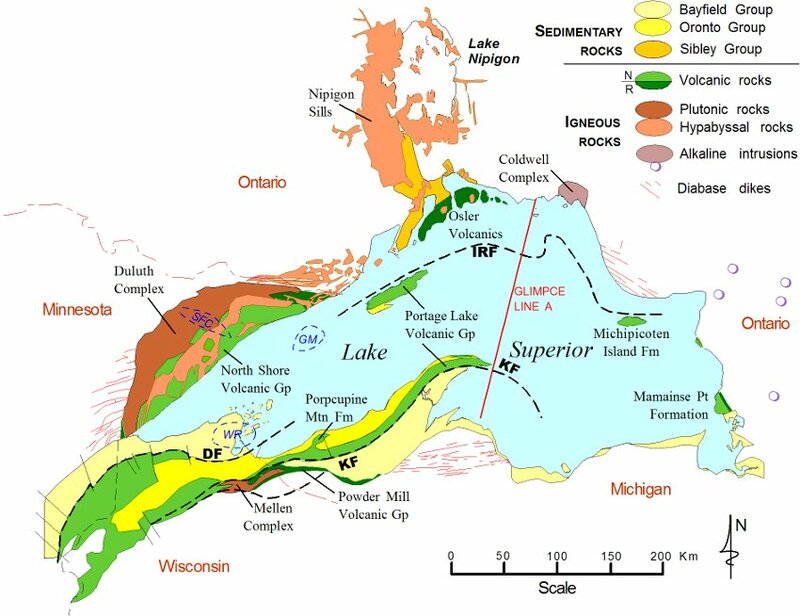 Allen, D.J., Hinze, W.J., Dickas, A.B., and Mudrey, M.G., Jr., 1997, Integrated geophysical modeling of the North American Midcontinent Rift System: New interpretations for western Lake Superior, northwestern Wisconsin, and eastern Minnesota. In: Ojakangas, R.J., Dickas, A.B., Green, J.C., (eds.) Middle Proterozoic to Cambrian Rifting, Central North America: Geological Society of America Special Paper 312, p.47-72. Anderson, R.R., 1997, Keweenawan Supergroup clastic rocks in the Midcontinent Rift of Iowa In: Ojakangas, R.J., Dickas, A.B., Green, J.C., (eds.) Middle Proterozoic to Cambrian Rifting, Central North America: Geological Society of America Special Paper 312, p.211-230. Annells, R.N., 1973, Proterozoic flood basalts of eastern Lake Superior: The Keweenawan volcanic rocks of the Mamainse Point area, Ontario: Geological Survey of Canada Paper 72-10, 51 p.
Annells, R.N., 1974, Keweenawan volcanic rocks of Michipicoten Island, Lake Superior, Ontario: Geological Survey of Canada Bulletin 218, 141 p.
Behrendt, J.C., Hutchinson, D.R., Lee, M.W., Thornber, C.R., Trehu, A.,Cannon, W.F., and Green, A.G., 1990, Seismic reflection (GLIMPCE) evidence of deep crustal and upper mantle intrusions and magmatic underplating associated with the Midcontinent Rift System of North America: Tectonophysics 173, p. 617-626. Bercovici, D., and Mahoney, J., 1995, Double flood basalts and plume head separation at the 660-kilometer discontinuity: Science 266, p. 1367-1369. Berendsen, P., 1997, Tectonic evolution of the Midcontinent Rift System in Kansas: In: Ojakangas, R.J., Dickas, A.B., Green, J.C., (eds.) Middle Proterozoic to Cambrian Rifting, Central North America: Geological Society of America Special Paper 312, p.2351-242. Bornhorst, T.J., Paces, J.B., Grant, N.K., and Obradovich, J.D., and Huber, N.K., 1988, Age of native copper mineralization, Keweenaw Peninsula, Michigan: Economic Geology 83, p. 619-625. Brannon, J.C., 1984, Geochemistry of successive lava flows of the Keweenawan North Shore Volcanic Group [Ph.D. thesis]: Washington University, St. Louis, 312 p.
Campbell, I.H. and Griffiths, R.W., 1990, Implications of mantle plume structure for the evolution of flood basalts: Earth and Planetary Science Letters 99, p. 79-93. Cannon, W.F., 1994, Closing of the Midcontinent rift—A far-field effect of Grenvillian compression: Geology 22, p. 155-158. Cannon, W.F., 1992, The Midcontinent rift in the Lake Superior region with emphasis on its geodynamic evolution: Tectonophysics 213, 41-48. Cannon, W.F., and Nicholson, S.W., 1992, Revisions of stratigraphic nomenclature within the Keweenawan supergroup of northern Michigan: U.S.Geological Survey Bulletin 1970-A, 8 p.
Cannon, W.F., and Hinze, W.J., 1992, Speculations on the origin of the North American Midcontinent rift: Tectonophysics, v. 213, 49-55. Chandler, V.W., 1990, Geologic interpretation of gravity and magnetic data over the central part of the Duluth Complex, northeastern Minnesota: Economic Geology 85, 816-829. Chandler, V.W., McSwiggen, P.L., Morey, G.B., Hinze, W.J., and Anderson, R.R., 1989, Interpretation of seismic reflection, gravity and magnetic data across Middle Proterozoic Mid-Continent Rift, northwestern Wisconsin, eastern Minnesota and central Iowa: American Association of Petroleum Geology Bulletin 73, 261-275. Currie, K.L., 1976, The alkaline rocks of Canada: Geological Survey of Canada Bulletin 239, 228 p.
Daniels, D.L., and Snyder, S.L., 2002, Wisconsin Aeromagnetic and Gravity Maps and Data: A Web Site for Distribution of Data: U.S. Geological Survey Open File Report 02-493, online only at http://pubs.usgs.gov/of/2002/of02-493/ . Davis, D.W. and Paces, J.B., 1990, Time resolution of geologic events on the Keweenaw Peninsula and implications for development of the Midcontinent Rift system: Earth Planetary Science Letters 97, p. 54-64. Davis, D.W., and Green, J.C., 1997, Geochronology of the North American Midcontinent rift in western Lake Superior and implications for its geodynamic evolution. Canadian Journal of Earth Science, v. 34, p. 476-488. Dickas, A.B., and Mudrey, M.G., Jr., 1997, Segmented structure of the Middle Proterozoic Midcontinent Rift System, North America: In: Ojakangas, R.J., Dickas, A.B., Green, J.C., (eds.) Middle Proterozoic to Cambrian Rifting, Central North America: Geological Society of America Special Paper 312, p.37-46. Easton, R.M., 1992, The Grenville Province and the Proterozoic history of central and southern Ontario, in Geology of Ontario: Ontario Geological Survey Special Volume 4, Part 2, p. 715-904. Gallagher, K. and Hawkesworth, C., 1994, Mantle plumes, continental magmatism and asymmetry in the South Atlantic: Earth and Planetary Science Letters 123, p. 105-117. Green, J.C., 1972, North Shore Volcanic Group, in Sims, P.K., and Morey, G.B., eds., Geology of Minnesota—A centennial volume: Minnesota Geological Survey, p. 294-332. Green, J.C., 1986, Lithogeochemistry of Keweenawan igneous rocks: Minnesota Department of Natural Resources- Division of Minerals Project 241-4, Open File Report, 94 p.
Green, J.C. and Fitz, T.J., III, 1993, Extensive felsic lavas and rheoignimbrites in the Keweenawan Midcontinent rift plateau volcanics, Minnesota: petrographic and field recognition: Journal of Volcanology and Geothermal Research 54, p. 177-196. Green, J.C., Easton, R.M., Miller, J.D., Jr., and Vervoort, J.D., 2005 Geochronology of the igneous rocks of the Midcontinent Rift System: A review. 39th Annual Geological Society of America North-central Sectional Meeting, Minneapolis, MN, Abstracts with Program, v. , no. p.
Heaman, L.M., Easton, R.M., Hart, T.R., Hollings, P., MacDonald, C.A., and Smyk, M., 2007, Further refinement to the timing of Mesoproterozoic magmatism, Lake Nipigon region, Ontario: Canadian Journal of Earth Sciences, V. 44, p. 1055-1086. Hinze, W.J., Wold, R.J., and O'Hara, N.W., 1982, Gravity and magnetic anomaly studies of Lake Superior, in Wold, R.J., and Hinze, W.J., eds., Geology and tectonics of the Lake Superior Basin: Geological Society of America Memoir 156, p. 203-222. Hinze, W.J., Braile, L.W., and Chandler, V.W., 1990, A geophysical profile of the southern margin of the Midcontinent rift system in western Lake Superior: Tectonics 9, p. 303-310. Hinze, W.J., Allen, D.J., Fox, A.J., Sunwood, D., Woelk, T., and Green, A.J., 1992, Geophysical investigations and crustal structure of the North American Midcontinent Rift system: Tectonophysics 213, 17-32. Hollings, P. Hart, T., Richardson, A., and MacDonald C.A., 2007A, Geochemistry of the Mesoproterozoic intrusive rocks of the Nipigon Embayment, northwestern Ontario: evaluating the earliest phases of rift development: Canadian Journal of Earth Sciences, V. 44, p. 1087-1110. Hollings, P., Richardson, A., Creaser, R.A., and Franklin, J.M., 2007B, Radiogenic isotope characteristics of the Mesoproterozoic intrusive rocks of the Nipigon Embayment, northwestern Ontario: Canadian Journal of Earth Sciences, V. 344, p. 1111-1129. Holm, D. K., Anderson, R., Boerboom, T.J., Cannon, W.F., Chandler, V., Jirsa, M., Miller, J., Schneider, D.A., Schulz, K.J., and Van Schmus, W.R., 2007, Reinterpretation of Paleoproterozoic accretionary boundaries of the north-central United States based on a new aeromagnetic-geologic compilation: Precambrian Research v. 157, p. 71-79. Hutchinson, D.R., White, R.S., Cannon, W.F., and Schulz, K.J., 1990, Keweenawan hot spot: Geophysical evidence for a 1.1 Ga mantle plume beneath the Midcontinent Rift system: Journal of Geophysical Research, v. 95, 10,869-10,844. Klewin, K.W. and Berg, J.H., 1990, Geochemistry of the Mamainse Point volcanics, Ontario, and implications for the Keweenawan paleomagnetic record: Canadian Journal of Earth Sciences 27, p. 1194-1199. Klewin, K.W. and Berg, J.H., 1991, Petrology of the Keweenawan Mamainse Point lavas, Ontario: petrogenesis and continental rift evolution: Journal of Geophysical Research 96B, p. 457-474. Klewin, K.W., and Shirey, S.B., 1992, The igneous petrology and magmatic evolution of the Midcontinent rift system: Tectonophysics 213, p. 33-40. Kushiro, I., 1980, Viscosity, density, and structure of silicate melts at high pressures, and their petrological applications, In: Hargraves, R.B., ed., Physics of magmatic processes. Princeton University Press, Princeton, p. 93-120. Lightfoot, P.C., Sutcliffe, R.H., and Doherty, W., 1991, Crustal contamination identified in Keweenawan Osler Group tholeiites, Ontario: A trace element perspective: Journal of Geology 99, p. 739-760. Manson, M.L. and Halls, H.C., 1994, Post-Keweenawan compressional faults in the eastern Lake Superior region and their tectonic significance: Canadian Journal of Earth Sciences 31, p. 640-651. Mariano, J. and Hinze, W.J., 1994, Structural interpretation of the Midcontinent rift in eastern Lake Superior from seismic reflection and potential-field studies: Canadian Journal of Earth Sciences 31, p. 619-628. McGinnis, L.D. and Mudrey, M.G., Jr., 1991, Seismic reflection profiling and tectonic evolution of the Midcontinent rift in Lake Superior: Wisconsin Geological and Natural History Survey Miscellaneous Paper 91-2. Miller, J.D., Jr., and Weiblen, P.W., 1990, Anorthositic rocks of the Duluth Complex: Examples of rocks formed from plagioclase crystal mush: Journal of Petrology, v. 31, p. 295–339. Miller, J.D., Jr., and Chandler, V.W., 1997, Geology, petrology, and tectonic significance of the Beaver Bay Complex, northeastern Minnesota. in Ojakangas, R.J., Dickas, A.B., Green, J.C. (editors), Middle Proterozoic to Cambrian Rifting, Central North America: Boulder, Colorado, Geological Society of America Special Paper 312, p. 73-96. Miller, J.D., Jr., and Vervoort, J.D., 1996, The latent magmatic stage of the Midcontinent rift: A period of magmatic underplating and melting of the lower crust: 42nd Annual Institute on Lake Superior Geology, Proceedings Volume, Part I – Program and Abstracts, p. 33-35. Nicholson, S.W., 1992, Geochemistry, petrography, and volcanology of rhyolites of the Portage Lake Volcanics, Keweenaw Peninsula, Michigan: U.S. Geological Survey Bulletin 1970-B, 57 p.
Nicholson, S.W., and Shirey, S.B., 1990, Midcontinent Rift volcanism in the Lake Superior region: Sr, Nd, and Pb isotopic evidence for a mantle plume origin: Journal of Geophysical Research, v. 95, 10,851-10,868. Nicholson, S.W., Schulz, K.J., Shirey, S.B., and Green, J.C., 1997, Rift-wide correlation of 1.1 Ga Midcontinent rift system basalts: implications for multiple mantle sources during rift development: Canadian Journal of Earth Sciences, V. 34, p. 504-520. Ojakangas, R.W. and Morey, G.B., 1982, Keweenawan sedimentary rocks of the Lake Superior region: A summary, in Wold, R.J., and Hinze, W.J., eds., Geology and tectonics of the Lake Superior Basin: Geological Society of America Memoir 156, p. 203-222. Olmsted, J.F., 1969, Petrology of the Mineral Lake intrusion, northwestern Wisconsin, in Isachsen, Y.W., ed., Origin of anorthosites and related rocks: New York State Museum and Science Service Memoir 18, p. 149-161. Paces, J.B., and Bell, K., 1989, Non-depleted subcontinental mantle beneath the Superior Province of the Canadian Shield: Nd-Sr isotopic and trace element evidence from Midcontinent Rift basalts: Geochimica et Cosmochimica Acta, v. 53, p. 2023-2035. Paces, J.B. and Miller, J.D., Jr., 1993, Precise U-Pb ages of Duluth Complex and related mafic intrusions, northeastern, Minnesota: new insights for physical, petrogenetic, paleomagnetic and tectono-magmatic processes associated with 1.1 Ga Midcontinent rifting: Journal of Geophysical Research V.98, No B8, 13,997-14,013. Palmer, H.C. and Davis, D.W., 1987, Paleomagnetism and U-Pb geochronology of volcanic rocks from Michipicoten Island, Lake Superior, Canada: Precise calibration of the Keweenawan polar wander track: Precambrian Research 37, p. 157-171. Rosendahl, B.R., 1987, Architecture of continental rifts with special reference to East Africa: Annual Reviews of Earth and Planetary Sciences 15, p. 445-503. Samson, C. and West, G.F., 1994, Detailed basin structure and tectonic evolution of the Midcontinent rift system in eastern Lake Superior from reprocessing of GLIMPCE deep reflection seismic data: Canadian Journal of Earth Sciences 31, p. 629-639. Sexton, J.L. and Henson, H., Jr., 1994, Interpretation of seismic reflection and gravity profile data in western Lake Superior: Canadian Journal of Earth Sciences 31, p. 652-660. Seifert, K.E., Peterman, Z.E., and Thieben, S.E., 1992, Possible crustal contamination of Midcontinent rift igneous rocks: examples from the Mineral Lake intrusions, Wisconsin: Canadian Journal of Earth Sciences 29, p. 1140-1153. Shirey, S.B., 1997, Re-Os isotopic compositions of Midcontinent rift system picrites: implications for plume-lithosphere interaction and enriched mantle sources: Canadian Journal of Earth Sciences, V. 34, p. 489-503. Shirey, S.B., Klewin, K.W., Berg, J.H., and Carlson, R.W., 1994, Temporal changes in the sources of flood basalts: Isotopic and trace element evidence from the 1100 Ma old Keweenawan Mamainse Point Formation, Ontario, Canada: Geochimica Cosmochimica Acta 58, p. 4475-4490. Sutcliffe, R.H., 1987, Petrology of Middle Proterozoic diabases and picrites from Lake Nipigon, Canada: Contributions to Mineralogy and Petrology 96, p. 201-211. Swanson, D.A., Wright, T.L., Helz, R.T., 1975, Linear vent systems and estimated rates of magma production and eruption for the Yakima Basalt on the Columbia Plateau: American Journal of Science 275, p. 877-955. Teskey, D.J., Thomas, M.D., Gibb, R.A., Dods, S.D., Kucks, R.P., Chandler, V.W., Fadaie, K., and Phillips, J.D., 1991, High resolution aeromagnetic survey of Lake Superior: Eos, Transactions, American Geophysical Union 72:81, p. 85-86. Thomas, M.D. and Teskey, D.J., 1994, An interpretation of gravity anomalies over the Midcontinent rift, Lake Superior, constrained by GLIMPCE seismic and aeromagnetic data: Canadian Journal of Earth Sciences 31, p. 682-697. 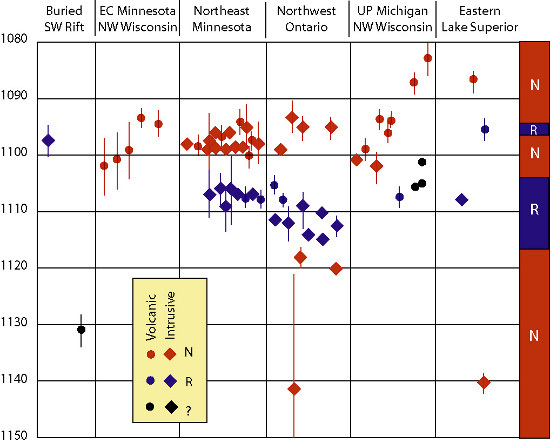 Vervoort, J.D., and Green, J.C., 1997, Origin of evolved magmas in the Midcontinent rift system, northeast Minnesota: Nd-isotope evidence of melting of Archean crust: Canadian Journal of Earth Sciences, V. 34, p. 521-535. Vervoort, J.D., Wirth, K., Kennedy, B., Sandland, T., and Harpp, K.S., 2007, The magmatic evolution of the Midcontinent Rift: New geochronologic and geochemical evidence from felsic magmatism: Precambrian Research, v. 157, p. 235-268. White, R.S and McKenzie, D.P., 1989, Magmatism at rift zones: The generation of volcanic continental margins and flood basalts: Journal of Geophysical Research 94, p. 7685-7729. White, R.S., 1997, Mantle temperature and lithospheric thinning beneath the Midcontinent rift system: evidence from magmatism and subsidence: Canadian Journal of Earth Sciences, V. 34, p. 464-475. Wirth, K. R., Naiman, Z.J., Vervoort, J.D., 1997, The Chengwatana Volcanics, Wisconsin and Minnesota: petrogenesis of the southernmost volcanic rocks in the Midcontinent rift: Canadian Journal of Earth Sciences, V. 34, p. 536-548. Woelk, T.S. and Hinze, W.J., 1991, Model of the Midcontinent rift system in northeastern Kansas: Geology 19, p. 277-280. Zartman, R.E., Nicholson, S.W., Cannon, W.F., and Morey, G.B., 1997, U-Th-Pb zircon ages of some Keweenawan Supergroup rocks from the south shore of Lake Superior: Canadian Journal of Earth Sciences, V. 34, p. 549-561.